This is our 2 year old GSD named Sadie. Sadie is a very intelligent strong dog. She was hit by a car at 11 months old and survived with no broken bones or any other deadly injuries. Sadie is very obedient and protective over our family. She loves us unconditional and the feeling is mutual for us ! A mans best friend is a GSD! 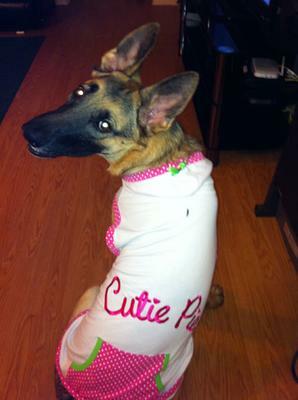 Thanks so much for sharing your story and photo of your beautiful German Shepherd female, Sadie with us. I am so relieved to hear she suffered no injuries after being hit by a car. She's a very lucky young lady because it could have been so much worse! Continued success with her in the future and keep us up on her as she grows up. It's always nice to see updates via photos and posts later on down the road on all our German Shepherd buddies and their families! Your Sadie is such a "Cutie Pie"! She has strong bones which protect her body from injury. Looks like she is a bit spoiled which is Okay, she deserves it. My Mia is two and she is obedient and very protective, you can read our story just look for puppy mia story and Mia my beautiful german shepherd dog. Take care of your girl Sadie and she will take care of you! Sadie is the most loyal dog to her family. She's beautiful and more intelligent than humans! God bless Sadie!